Flagged Entries are Tasks and Log Entries that require additional followup. The Flagged Entries View provides an instant consolidated view of all Flagged Entries throughout Manager Log. Click through any entry to open the full entry and provide any additional update or follow-up entries or tasks. To flag an entry or task, a User simply has to click the flag icon on the entry or task. 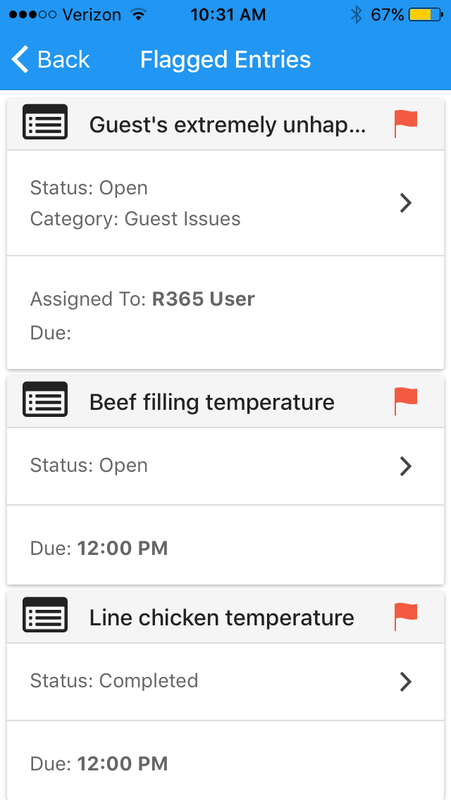 This will immediately move the entry or task in to the 'Flagged Entries' view. Click the flag icon again to 'uncheck' it. Task Lists that contain 'Whole Number' and 'Decimal Number' task response criteria can set two optional fields called 'Goal' and 'Tolerance'. ‘Goal’ represents the desired whole or decimal number goal for the task, while ‘Tolerance’ represents the acceptable or tolerable variance from the goal. Any value that falls outside (plus or minus) of the ‘Tolerance’ value will result in the Task being automatically flagged for additional follow up.